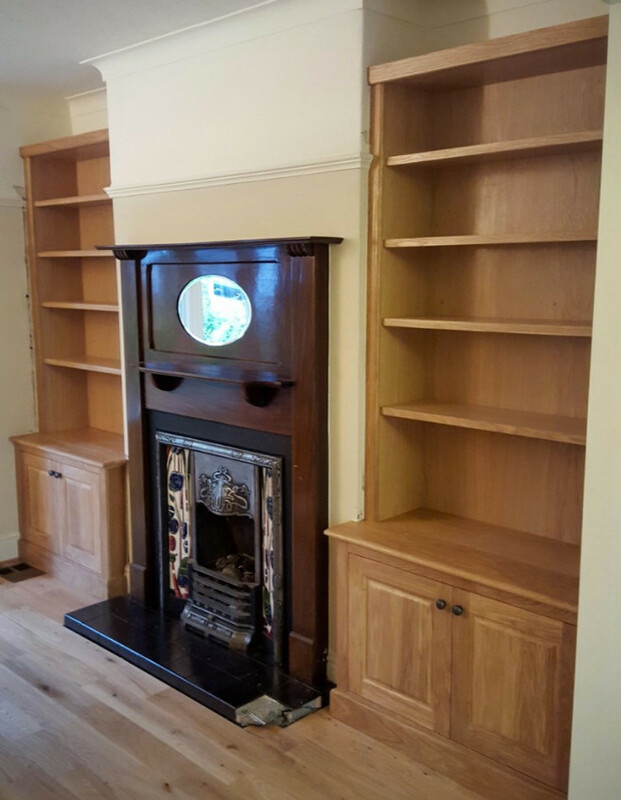 We have designed and built numerous storage solutions for the living room alcoves of Sheffield. Is it time for you also to ditch the billy bookcases and do your house proud? Custom designed floating shelves and shaker style cupboard, hand-painted in a brilliant white eggshell finish. For a Victorian terraced house in Sheffield, near Endcliffe Park. 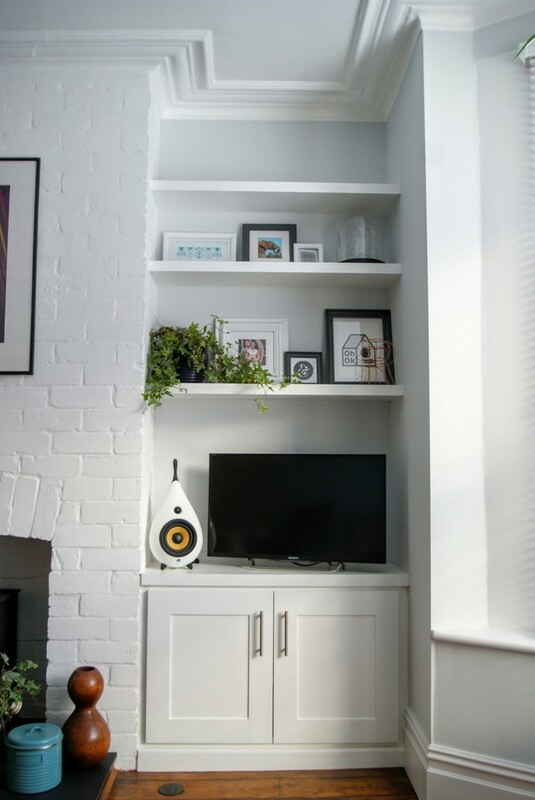 Custom designed floating shelves and shaker style cupboard hand-painted in a brilliant white eggshell finish. For a Victorian terraced house in Sheffield, near Endcliffe Park. The space inside the narrow cupboard was designed to incorporate a sky box stood on end, with a cutout in the shelf for cabling. Devices like this can be remote controlled from inside the cupboard using an IR Repeater available from Maplin. For this installation the customer chose our classic door style with a simple plinth arrangement and modern floating shelves. As shown in this example, we recommend 3-door cupboards for alcoves wider than 120cm. Also we have used an extra thick cantilevered shelf style which does not require fixing to the sides of the alcove. A contemporary shaker style alcove installation with floating shelves. 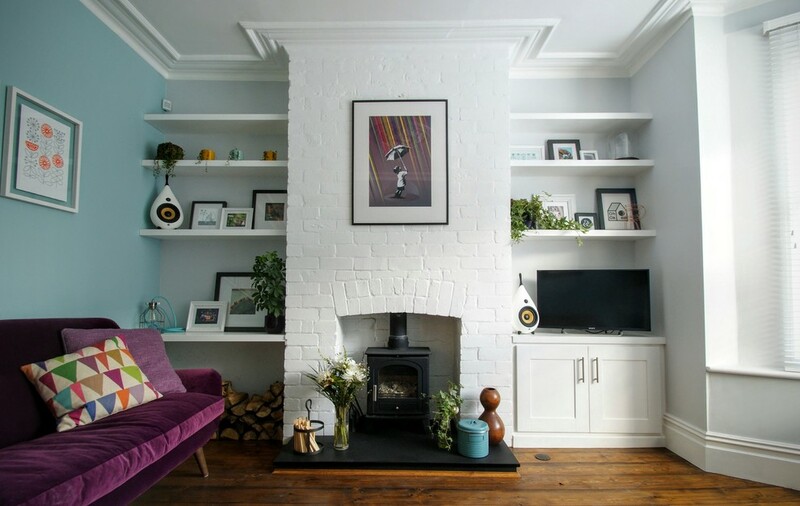 Modern shaker style fitted alcoves with floating shelves and cupboards projecting forward of the chimney breast. Modern Shaker Style Alcoves with the cupboards finishing flush with the chimney breast, and one cupboard at an angle to receive a TV. Classic style alcove painted in off white eggshell paint. A classic styled alcove with angled TV cupboard and extra dividers to the bookshelves. For this installation we used modern chunky floating shelves and classic styled cupboards elevated to allow us to match the existing skirting. Bespoke Alcove storage and display cabinets in handpainted tulipwood and solid oak tops. Bespoke Alcove cupboards in handpainted tulipwood and oiled solid oak tops. Custom-designed fitted alcove units, hand painted in an off-white shade. Integrated LED striplighting and cabling for audio. Left-side unit of a pair of custom-designed fitted alcove units, hand painted in an off-white shade. 20º angle-fronted base cabinet for the TV, in a pair of custom-designed fitted alcove units, hand painted in an off-white shade. Close up of a raised and fielded panel door style. 2 floor-to-ceiling fitted alcove installations in adjoining rooms, with solid wood frontages and traditional detailing. Built-in lighting on a motion sensitive dimmer switch. A traditional unit with a budget door style and fluted detailing. A traditionally styled base cabinet with modern floating shelves above. We can fit to awkward spaces - this Sheffield house was part of a curved terrace near Endcliffe park, and there were no right-angles to fit to! A contemporary alcove installation with handle-less (push-to-open) slab doors and floating shelves above. 2 Classic alcove units in oak. Custom designed fitted Alcove units in oak.